No specific threat information but be wary, says U.S. Heavy rains over consecutive days and nights last weekend flooded Chiang Mai City resulting in countless thousands of baht damage. According to authorities, the municipality was on the verge of announcing an emergency. Water flowing from the high areas and mountains like Doi Suthep, caused flash floods, which inundated the Chiang Mai Muang District, as well as some other districts, prompted relief work and operations from both public and private sectors. Roads turned to klongs last weekend in some of the worst flooding in recent memory. More pictures inside. 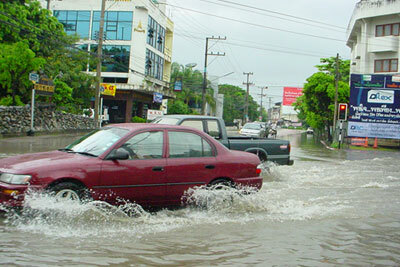 Several main roads in the city were disrupted, especially the Chiang Mai-Hang Dong, Huay Kaew and Suthep roads. 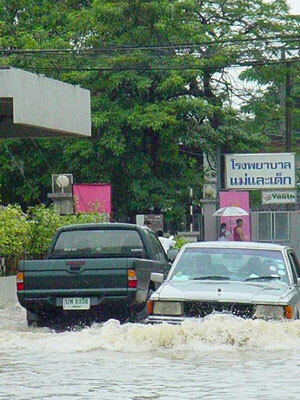 In the Muang district, floods were along Ratchadamnoen Road and Maneenopparat Road, exacerbated by the overflow of the city’s moats. Floods at the Sripingmuang community of Tambon Haiya measured up to 1 meter. 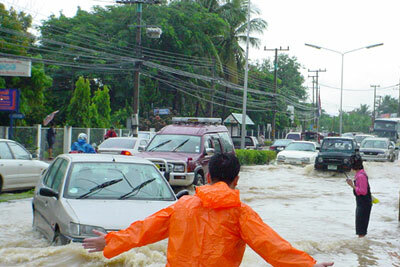 The floods in several areas of Chiang Mai prompted public relief work operations by rescue teams in flat-bottomed boats. 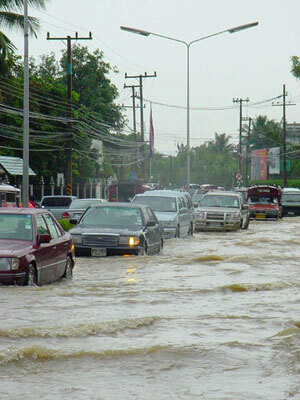 Other problems resulted from the overflow from the Klong Chollaprathan canals, starting from Tambon Suthep in the north to Tambon Mae Hia in the south of the city. 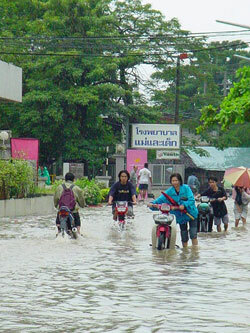 In the Kulaphan Ville housing estate and Wangtan housing estate and on the Chiang Mai - Hang Dong road, the water was measured as high as half a meter. 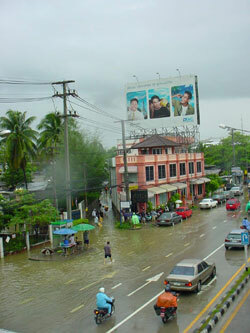 Commercial developments in Tambon Nongkwai and Tambon San Pakwan in Hangdong District were also affected. The Northern Regional Meteorological Center reported record rainfall of 108 mm in some areas, as high pressure areas from China spread southward to cause the heavy rains. Chiang Mai Municipality has already prepared a plan to cope with any further flash floods and has 20,000 sandbags packed and prepared for use in building retaining walls. Other plans include organization of manpower and a 200-person relief force including volunteers. The municipality also has five water pumps, two excavators and other appropriate equipment. 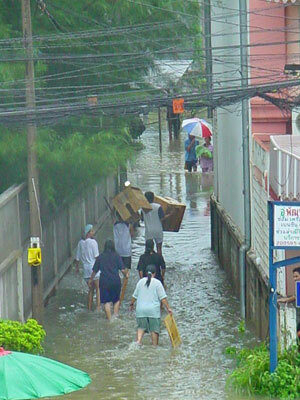 Sois and alleyways were also overflowing as record rainfall inundated Chaing Mai last weekend. When the rain didn’t let up, the flooding only got worse. the floodwaters and take to pushing their motorcycles through to the other side. One can only hope these vehicles were watertight. Getting around certain areas of the city was an adventure. 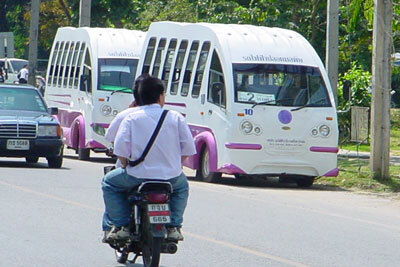 Chiang Mai Mayor Boonlert Buranupakorn has informed the Chiangmai Mail that the electric shuttle is now in progress. The municipality ordered 10 electric school busses from the Electric Shuttle Company Limited in Bangkok to serve the students going to Monfort College, primary section; Sacred Heart College, Regina Coeli College and Chairoj School. The electric shuttle school buses are now in service. Chiang Mai municipality is cooperating with the 4 schools along Charoen Prathet Road to finalize the electric shuttle routes for solving the peak period traffic problem. There will be 3 loops for the shuttles to run and pick up the children. Punyapol Monkolcharoen, chief of the Municipal Enterprise Division of the Chiang Mai Municipal Clerk Office says that the 3 loops will pass Nong Hoi Home Estate, Nawarat Bridge, and Chang Klan Road. The traffic police will facilitate the traffic by setting aside the bus lanes for the electric shuttles and the bus stops for the parents to set down their children. It is believed that schools will provide the teachers for taking care of the students but currently the kindergarten children are not allowed to use this kind of transportation. The week everybody is waiting for is coming closer. Full Moon in November is a very special time for all Buddhists in Thailand. However, this is a special time for everyone, be they young, old, rich or poor, Thais and foreigners, residents and tourists. And one of the best places to be from November 16th to November 20th is Chiang Mai. There are many events taking place, including the Noppamas Kids beauty contest on the full moon night on November 16 at Kad Suan Kaew shopping complex. Kad Suan Kaew shopping complex invites all children aged 5-8 years to join in the “Noppamas” event (the one who sits in “krathong” on Yipeng day). The contest will be held between 3.30 and 8.30 p.m. in the outdoor field of Kad Suan Kaew. The winners will receive scholarships and the competitors will receive souvenirs from the department store. The children who want be in this contest will have to apply before November 12 and bring their current photos and house papers to the application centre at Kad Suan Kaew. After the first round of judging, the committee will choose only 15 boys and 15 girls to go into the second round. In the second round children will have to show their skills presenting Lanna art and culture, such as folk dancing or playing local instruments. Each child will have just over three minutes to display his or her talents. First prize is a 2,500 baht scholarship with 2,000 baht for the second and 1,500 baht for the third place. There will also be a Miss and Mr. Popular title through public voting, with 4,000 baht going to the winner. One hundred people from the Third Region’s high ranking military officers, and academics from universities met last weekend to discuss national security measures. The national security problems dealing with the North’s border, drugs and terrorism were the top priority at the seminar jointly held by the Consulate of Sweden, the Third Army Region, Chulalongkorn University and Chiang Mai University held at the YMCA Chiang Mai. (L to R) HE Swedish Consul Vorakit Kantakalung, Asst Prof Dr Chaichok Chulasiriwong, Gen Siri Thiwaphan, deputy 3rd Army Region commander Maj Gen Picharnmeth Muagmanee, Head of the International Relations Department of Chulalongkorn University, Dr Surachart Bamrungsuk, and Col Dr Peerapong Manakitch, secretary of the Senate Standing Committee on Military Affairs at the press conference held at YMCA Chiang Mai. Gen Dr Siri Thiwaphan, senator, and deputy chairman of the Senate Standing Committee on Military Affairs, told Chiangmai Mail that the military officers must now become involved in operations in keeping peace in this age of globalization, saying that the military now needs additional active roles and functions, apart from war. This was backed up by Dr Surachart Bamrungsuk of Chulalongkorn University, referring to the address “The Military in Peace time, Military Operations Other Than War and Peacekeeping Operations”. The seminar felt that the general situation along the Thai-Burmese border, and in particular drug trafficking, has not deteriorated, but a watch must still be undertaken. Gen Dr Siri stressed that sensationalism that might negatively affect the neighboring countries and international relations should be avoided. “The press should be careful on this issue; however, I believe that the Thai mass media love the Thai nation, and the future of the country,” he said. The feeling from the seminar was that the Third Region Army wants the army soldiers and officers to work in close cooperation with other agencies such as the Forestry Office and the Office of the Narcotics Control Board (ONCB). Additionally, H.E. Vorakit Kantakalung, the Consul for Sweden added that there is much development work and projects to be done in the thousands of villages, that perhaps by the NGO’s working together with the army this would be advantageous as so many defense villages are located strategically along the borders. The problems of mutual understanding is often discussed among the border working committee so to build up or strengthen the villages along the border districts will be a fence blocking the refugees and alien labor from entering the country. There are currently up to one million Burmese aliens living in Thailand. Gen Dr Siri admitted one very important factor, “One problem is the budget shortfall,” he said, adding that the northern region is where the budget was very often short. “For the next fiscal year, the budgetary amount is expected to be less than this year,” he said, noting that the government should look at this weak point. The top priority is national security, border economy problems, terrorism, and the drug trade, according to Gen Dr Siri. “It is not only war or battle, but this the army’s work covers all military operations other than war, and it includes the peace keeping operations and development work for the country. Military officers should adjust their attitudes and thinking to encompass the changes,” he noted. The 3rd Nimmanheminda Art and Design Promenade will be held on December 5-8 this year in celebration of His Majesty the King’s birthday. The Amari Rincome Hotel, in cooperation with the shops along Nimmanhaeminda Road and many well known shops in Chiang Mai have arranged the street festival. There will be more than 80 shops at this fair, all of which will be offering special prices for the duration of the fair. This fair will also promote the Nimmanheminda shopping quarter to become better known in Chiang Mai and nearby provinces. To encourage Chiang Mai tourism there will also be music performances, exhibitions of local culture, and handicrafts created and designed by Thai artists. Other activities will include a fashion show from Paothong Shop and the Faculty of Fine Art, Chiang Mai University; children’s art display, local instrumental show from Payap University, exhibits from Japanese and seniors in the community, and a jazz and ballet show. Fair goers can also see a puppet show from the dramatic group, “Phra Chan Panejorn” (Wandering Moon), one of the most famous groups in Chiang Mai. The 11th Japan Education Fair will take place in the Santor Room, Lotus Pang Suan Kaew Hotel, finishing this Saturday November 9 to provide information for those interested in studying in Japan. The organizers include the Chiang Mai Japanese Club, Japan’s Consulate in Chiang Mai, Japanese Public Health in Thailand, Japan’s Alumni under Royal Patronage, Northern Section, and Lotus Pang Suan Kaew Hotel. The fair is an annual event arranged by Japanese organizations in Chiang Mai, mainly focusing on studying in Japan. This year there will be two Japanese films, plus Japanese dance shows by Ko Misutami, a demonstration of ‘Kendo’ by Japanese experts, a demonstration of Kimono dressing, and a lecture given by Dr. Narathip Tiangtae, a teacher from Chiang Mai University. This Saturday is the final day of the fair which will run from 9.30 a.m. to 4.45 pm. IBM Thailand Co., Ltd., has opened its new branch in Chiang Mai to provide service, after sales service and spare parts in the northern region. On the 10th anniversary of IBM Thinkpad and the 50th anniversary of IBM Thailand, its new branch will be opened at the IBM Service Center at Chiangmai Land House Estate on Chang Klan Road. IBM additionally has planned to open other IBM Service Centers in large cities, including Nacho Archaism, Hat Yak, Adorn Thane and Conjure. The Lanna Transport Cooperative is demanding a formal agreement with Chiang Mai Municipality and Chiang Mai Provincial Office over the new public transport policy. The president of the cooperative is calling for fixed routes and income assurance. Singhakam Nanti, the president of the Lanna Transport Cooperative revealed to Chiangmai Mail that the red minibus members have not been officially informed about Chiang Mai’s new transportation system, where they felt the municipality was unilaterally planning to fix the bus routes and wanted to provide the electric shuttles for students. Singhakam said that he is ready to protect more than 10,000 members’ incomes if the provincial offices ignore their problem. “We are ready to protect ourselves against the unfair policy that does not care about our earnings. How can more than 10,000 members from 3,000 families manage to exist if we earn less money because of the new policy? We don’t understand what the municipality is doing. There is no progress on any proposals we have offered despite the fact that we are one group of those people who pay taxes for the country,” he said. The cooperative demands income assurance at THB 600 per day each which would mean the municipality must pay more than THB 1,000,000 per day for the new system. Singhakam insisted that the Lanna Transport Cooperative is willing to cooperate with the project if the municipality gives them the income assurance and agrees to their proposal that the outer city’s minibuses are not allowed to ply the red minibus’ routes and allocate the bus stops for them around the city which they believe is the best way to solve the Chiang Mai traffic problem. The Chiang Mai municipality is trying to solve the traffic problem by fixing 19 new routes for the red minibuses and ordering 10 electric shuttles for school students. The Lanna Transport Cooperative also revealed that their next project is to bring the taxi cars, as in Bangkok, to run in Chiang Mai. This project is already in progress as the Chiang Mai Provincial Land Transport Office has already received their proposal. Ministry of Labor and Social Welfare claims that it has spent almost 300 million baht in reparations after the recent floods over the past two months. This figure covers 48 provinces and 894,615 flood victims. The breakdown of expenses included 21 million baht to rebuild 1,460 houses and another 10 million baht for death compensation and funeral expenses. Due to the flood situation, the Ministry of Labor and Social Welfare has allocated 500 million baht to help over 2 million people affected in the 48 provinces, and they are also providing job training and job opportunities to the flood victims. The body of Harry Darling Walt, a 74-year-old Australian who had lived in Chiang Mai for over twenty years was found at the base of the cliff at the Huay Kaew Waterfall, known locally as Wang Bua Ban, at the foot of Doi Suthep Mountain. Pol Lt - Col Prasertsak Intrachak, the investigation inspector of Phuping Police Station, told Chiang Mai Mail that before the incident took place, the deceased was seen going to the highest point of the waterfall and was sitting there apparently looking depressed, according to witnesses, Natwiruth Siriwan and Mali Chaipitak, students of Ramkhamhaeng University. “We found no evidence to suggest murder, and the body has been sent for autopsy at Maharaj Nakorn Chiang Mai Hospital. His untimely death has been reported to the Australian Consulate and they will inform his relatives in Melbourne, Australia. Chiang Mai police were informed that a man and a woman had been found dead in a parked car on Chang Klan Road. The police confirmed they had found the car with two bodies inside. The body of a 35 year old woman, identified as Ms Tossaporn Nantanon, was found in the front seat, with a pistol wound to the left side of the head, and the body of a 26 year old male, identified as Terdsak Saraban was on the back seat, still holding a 9 mm pistol but having had a fatal pistol shot to the head. Police’s investigation revealed that Terdsak used to be a model and associated with Ms. Tossaporn, an accountant of the Airlines. Terdsak found that his girlfriend had another romantic interest and followed her to confront her and it ended up as a quarrel. Apparently, according to police, the woman had tried to end the relationship which made Terdsak angry and he shot his former girlfriend before committing suicide with the same weapon. Chiang Mai police released the latest statistics in the fight against teenager crime, showing almost 600 arrests and detentions during the period from September 20 to October 27. Arrests included 11 people with possession of firearms and 41 for possession of knives. 26 cases of assaults resulted in 36 arrests. Noisy motorcycles were also subject to police scrutiny with 490 offenders stopped for inspection resulting in 117 fines. Pol. Lt.- Col. Viroj Kesaporn, deputy superintendent of Mae Tang police station, has spoken out regarding teenage crime, saying that it might be the results of the media, such as imitating risky behavior seen in commercial advertisements or TV dramas. Many teenagers might mistakenly think that this is ‘normal’ behavior, so parents should take the time to talk with their children and direct them towards the correct understanding. In its latest Consular Information Sheet last week, the U.S. Department of State Bureau of Consular Affairs has the following information regarding Thailand. Safety and security: In the aftermath of the October 2002 terrorist bombings in Bali, Indonesia, the State Department is concerned that similar attacks may occur in other Southeast Asian nations. American citizens traveling to Thailand should therefore exercise caution, especially in locations where Westerners congregate, such as clubs, discos, bars, restaurants, hotels, places of worship, schools, outdoor recreation venues, tourist areas, beach resorts, and other places frequented by foreigners. They should remain vigilant with regard to their personal security. The far south of Thailand has experienced incidents of criminally and politically motivated violence, including incidents attributed to armed local separatist/extremist groups. Although these groups focus primarily on Thai government interests, U.S. citizen travelers should remain vigilant with regard to their personal security. At this time, there is no specific threat information. Tourists should also exercise caution in remote areas along the border with Burma. The Thai/Burma border is the site of on-going conflicts between the Burmese Army and armed opposition groups as well as clashes between Thai security forces and armed drug traffickers. In addition, pirates, bandits, and drug traffickers operate in these border areas. In light of the continuing unsettled situation along the Thailand border with Burma, which is subject to frequent closings to all traffic, the Department of State recommends that all Americans exercise caution when traveling in remote or rural areas immediately adjacent to the Burma border. There remains a possibility of significant flare-ups of military activity on the Burmese side of the border that could spill over into immediately adjacent areas of northern Thailand. Visitors should travel off-road in undeveloped areas only with local guides who are familiar with the area. As border closings and re-openings occur frequently, U.S. citizens considering traveling into Burma from Thailand should be aware that in the event of a border closure they may not be able to re-enter Thailand. Tourists should obtain information from Thai authorities about whether official border crossing points are open, and should cross into neighboring countries only at designated crossing points. Although tourists have not been targeted specifically by this occasional violence, due caution remains advisable. It is recommended that persons wishing to travel to border areas check with the Thai tourist police and the U.S. Consulate General in Chiang Mai or the U.S. Embassy in Bangkok. Registration/Embassy and Consulate Locations: Americans living in or visiting Thailand are encouraged to register, either online or in person at the Consular Section of the U.S. Embassy in Bangkok or the U.S. Consulate General in Chiang Mai. At both locations updated information on travel and security in Thailand is available. The Consular Section of the U.S. Embassy is located at 95 Wireless Road in Bangkok; the U.S. mailing address is APO AP 96546-0001. The central switchboard number is (66-2) 205-4000; the American Citizen Services Unit number is (66-2) 205-4049; and the fax number is (66-2) 205-4103. The web site for the U.S. Embassy is http://usa.or.th. American citizens can register online via the web site. Questions regarding American Citizens Services can be submitted by e-mail to <[email protected]>. The U.S. Consulate General in Chiang Mai is located at 387 Wichayanond Road; the U.S. mailing address is Box, C, APO AP 96546. The telephone number is (66-53) 252-629 and the fax number is (66-53) 252-633.